She began her education at age five at a local public grade school in Burlington, and attended Burlington Public Grammar School. It was during this time that she took an interest in music and took private piano lessons. In 1893, she entered Burlington High School. There she studied Latin and French, as well as geology, biology, and chemistry. She also took a private course on elocution. She enrolled in 1898 at the University of Vermont, where she founded the Vermont chapter of the Pi Beta Phi sorority, acted in productions of Shakespeare's Much Ado About Nothing and Twelfth Night, and joined the college's glee club. She would become the first First Lady to have earned a four-year undergraduate degree. From 1902 to 1904, inspired by a childhood friend who had pursued a career teaching deaf children, she studied lip reading at Clarke Schools for Hearing and Speech and became a teacher there. The education of deaf children remained her lifelong passion. Calvin Coolidge summed up his marriage to Grace in his autobiography: "For almost a quarter of a century she has borne with my infirmities, and I have rejoiced in her graces." For more privacy in Northampton, the Coolidges purchased The Beeches, a large house with spacious grounds. The former president died there after a sudden heart attack on January 5, 1933, at the age of 60. After her husband's death, Grace Coolidge continued her work on behalf of the deaf. She was also active in the Red Cross, civil defense, and scrap drives during World War II. Grace kept her sense of fun and her aversion to publicity until her death on July 8, 1957, at the age of 78. She is buried next to her husband in Plymouth, Vermont. 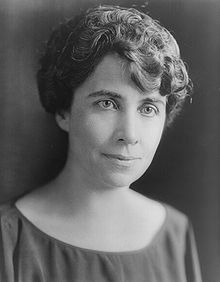 ^ "Grace Coolidge | biography - American first lady". Retrieved 2015-05-18. ^ a b c d e "Grace Coolidge Biography :: National First Ladies' Library". www.firstladies.org. Retrieved 2015-05-18. ^ 312 Maple Street, Burlington, VT 5401, The house was restored in 1993 by Champlain College. ^ "Grace Goodhue Coolidge - Burlington - Vermont Historical Markers on Waymarking.com". www.waymarking.com. Retrieved 22 March 2018. Coolidge, Grace (1992). Wikander, Lawrence E.; Ferrell, Robert H. (eds.). Grace Coolidge: An Autobiography. High Plains Pub. Co. ISBN 1881019012. LCCN 92072825. Wikimedia Commons has media related to Grace Coolidge.